Is Trump racist for building a wall? A: It could be, depending on your motives. If your motive is that you think all latinos are inferior to whites, and that's why you want to keep them out, then it could be racism. But the most likely explanation is that you believe in defending the immigration laws of the country, providing national security, and that immigration needs to be controlled. So unless you have evidence against the more likely scenarios, assuming the worst shows the bigotry of the accuser more than the accused. But that won't stop/slow the media left from doing it. The Mexico-American border is the most heavily crossed border in the world, both legally and illegally, and has a rich history of the Democrats promising to fix it or illegal immigration, then undermining it. The Democrats can only win elections if they have the young, dumb and disenfranchised voting for them -- so they do everything they can to make sure that base (including uneducated illegals) can get in, and be exploited, and exploit our system. That guarantees them money/power. 1960's and the "War on Drugs" started the creation of a barrier in earnest, and was expanded under Nixon in the early 1970's. 1986 Immigration Reform and Control Act (IRCA or Simpson–Mazzoli Bill) responded to rising illegal immigration problem by providing one-time-amnesty for 350,000 illegal immigrants (to offset fears of a lack of farm workers if there was an immediate crackdown), in return for increased border security (the promise of the fence by Democrats), decreasing illegal immigration, and penalties for companies "knowingly" hiring illegal immigrants. A couple decades later, Democrats had repeatedly broken their promise to help secure the border (and obstructed it), illegal immigration had over doubled, Simpson and Mazzoli both admitted regrets for it's failures (caused by Democrats undermining it), and and the 350K amnesty was actually 3 Million (about 1/6th of the adult male population of rural Mexico, using phony documents), and is called the greatest immigration fraud in American history. It showed what happens when you trust Democrats. 1994 NAFTA harmed Mexico previously protectionist agriculture with cheaper American produce, this (along with a booming dot-com economy) caused a big immigration wave north, and increased the pressure on better immigration controls. 2006, After 9/11 Congress authorized the Secure Fence Act, under the guise of national security: a multi-billion dollar plan to build hundreds of miles of fencing along the border. Hillary Clinton speaks out in favor of the wall. She tried to walk that back after the Trump issue by claiming she was "for a fence, but against a wall", completely Clinton'ing the topic. Yeah, a fence is less racist than a wall. 2014 ISIS and Al Queda are sending people to Mexico with the intent of them crossing the border and infiltrating the U.S. illegally. A few are caught in the U.S., but in immigrations usual catch and release program, they are released in U.S. before identified, and they disappeared. Press - OMG! Trump Manufactured this border crisis! Where we sit today is 580 miles of the 1,954-mile border with Mexico has some sort of official fence. (There are other tracts which may have something like cattle fencing / barbed wire, but are local ranchers fences, not official border control). Around 400 people die per year trying to cross the border illegally, but it fluctuates dramatically depending on the economy. There are a few overlapping issues : immigration laws, national security, and broken promises. 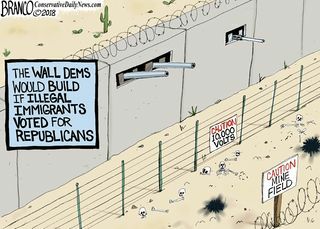 Republicans feel the Democrats have been promising then obstructing their side of the agreement -- because Democrats win key votes with the help of illegal aliens (lookup my old haunt, the 46th district and Bob Dornan / Loretta Sanchez as an example), and Democrats see it as a wedge issue where they can play both sides. They tell the Unions and Americans they'll fix it, tell latino's they're against it, and calls anyone that tries to fulfill their promises a racist. It's win-win for them. Progress is harder because of past broken promises by the Democrats, and their demagoguing. This is like when the Democrats torpedo'ing Bush's immigration reform by calling it amnesty, (turning his party against it), while selling the Latinos that the failure was all because of the Republicans. Or like Obama's unconstitutional executive overreach (he's been ruled against many times by federal judges and Supreme Court), or lies that ACA wouldn't cover illegal aliens (but does), that causes political backlash against amnesty and illegal aliens, then they use that backlash to paint the Republicans as racist, for this political fight. But if the wall / border fence is racist, then all the Democrats that supported it, including Hillary Clinton, are racists as well. No one should get it both ways: to get to accuse the other side of being evil for doing what their side advocated as well. Back: Is Trump a racist? This page was last edited on 2 February 2019, at 12:23.